Get caught up in these unique engagement gifts - one of a kind and handmade by Captured Wishes! Each includes a Shakespeare love card to describe and tell the story of the beautiful holographic colors that are layered in the wish vessel. Let this be your way to express how you feel about the news of union. This great wish gift is unique - it can be personalized in two ways - it can be given from a single person OR a group AND initials of the couple can be added to the heart link chain which encircles the wishes you all have for your two favorite people - a gift, a gift box, and a card. Ready to gift! This beautiful Captured Wish (height approx 30mm x 15mm width) calls upon the creativity of The Bard. Only Shakespeare could write so eloquently about love and romance. Your gift recipients are sure to appreciate the enduring nature of love between two people, still relevant over 400 years later! 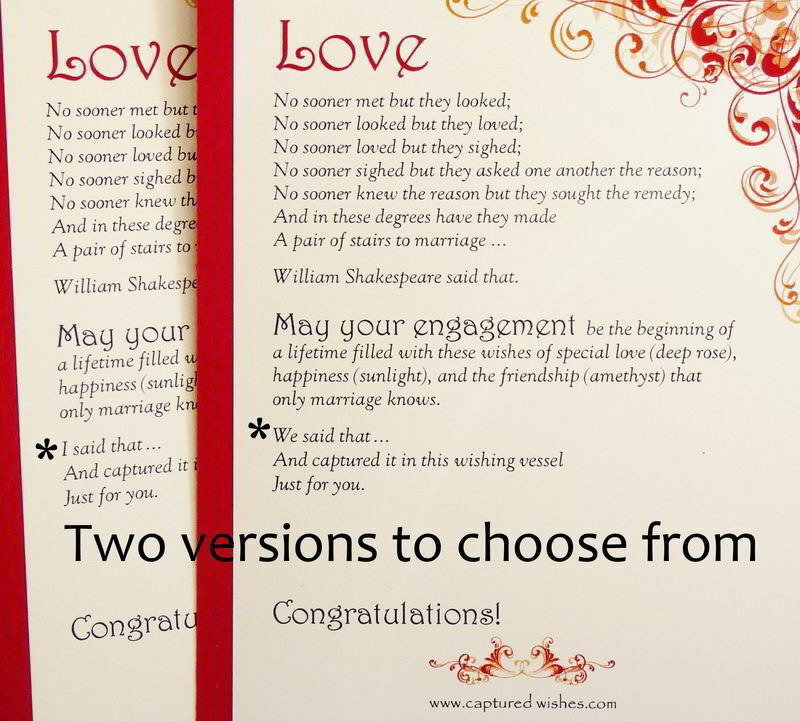 It comes in custom packaging and includes a Shakespeare Said card to witness in writing the moment and how you feel about the new union. Captivate the newly engaged couple by choosing the personalize option which uses the initials of your favorite couple to truly mark the gift as theirs alone.